Our Digital Revolution instrument is just around the corner (we promise!). We are currently in the final testing phase and hope to release very soon! In the meantime we have put together 5 minute video showing Digital Revolution in action. We are pleased to announce the release of a completely FREE 'slimmed down' demo version of our forthcoming Digital Revolution instrument. Users of Kontakt 5 (full version) are able to demo a small amount of what is possible with our soon to be released Digital Revolution instrument for Kontakt Player. 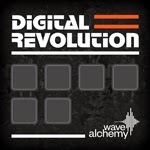 Digital Revolution SE will also work for 15 minutes in Kontakt Free Player under 'demo mode'. We are happy to announce that our second 'Revolution Engine' Instrument for Kontakt player is just around the corner! Digital Revolution puts classic digital drum sounds at your fingertips with sounds from 9 digital and 3 analogue drum machines spanning 1980 to 1989. "Loads of tribal loops in here to spice up your productions. The loops are all recorded to the highest quality and there is amazing variety. Highly recommended!"